It’s hard for even me to believe, but I have somehow neglected to explore Everfeld with you all, the setting of The Warden of Everfeld: Memento. However, I think that was for the best, because I have a very special surprise to help you all step into this world. My illustrator, Sergey, drew this amazing map for my novel, and then suggested we add some features to it for the online version! I wrote up descriptions for each of the main locations discussed through the story, and described the sigils used by some of the larger wards in Everfeld. But it was Sergey who brought it to life. 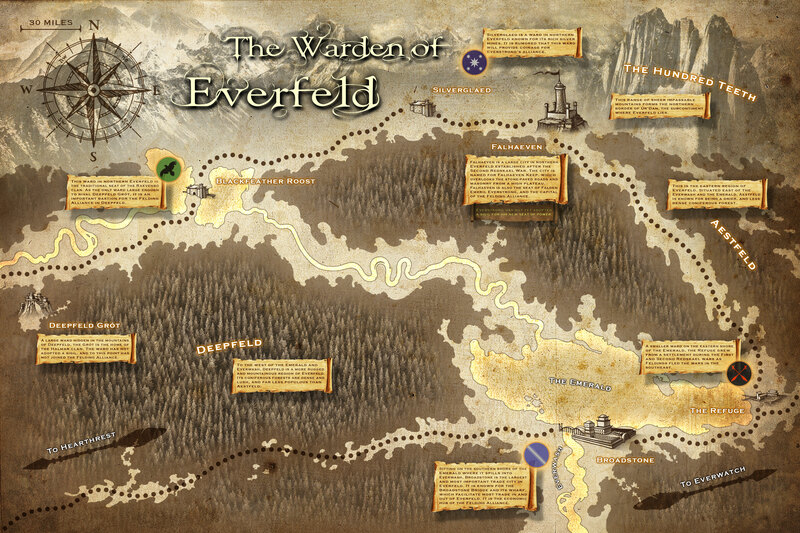 This map only shows about half of Everfeld, but there are many more wards and regions to explore. Aestfeld stretches into the lower ridges of the Hundred Teeth, which curve southward to hem in the forest. Everwatch, with its three high towers, gazes over the foothills and the Altpass, the only road through the mountains. The Everwash runs for many more miles until the forest ends, and it spills into the rolling plains of the Uplands. Wards like Washburn and Ever’s Edge rely on the river for trade and transport, but the Feldings there also venture into the Uplands more frequently to hunt the massive herds of antelope and boar there. The denser forest of Deepfeld thickens as wards become fewer and farther between. The Hundred Teeth curve southward to the west, hemming in this side of Everfeld as well. But, there is a small part of the forest that meets the sea. All told, Everfeld stretches over 600 mile from west to east, and over 200 miles from the Hundred Teeth to the Uplands. The Warden of Everfeld: Memento covers a lot of ground, but there is much more of Everfeld to uncover.